Below is a list of current shows, exhibits, and retailers featuring artwork by Linnea. Gamut Gallery is a visual art gallery and performance space dedicated to bringing people together. Their rotating exhibitions showcase the full spectrum of media, content and styles, with a focus on highlighting innovative local artists. Gallery salon with gifts, fashion, vintage, curiosities, and a curated collection of artwork by local artists. Hazel's NE is a friendly neighborhood restaurant featuring artwork by local artists. Visit to find selected canvases by Linnea featured among a rotating exhibit of local artists. Butter Bakery Cafe offers a gift shop selling Robot Adventure coloring books and greeting cards alongside their coffeeshop goodies. 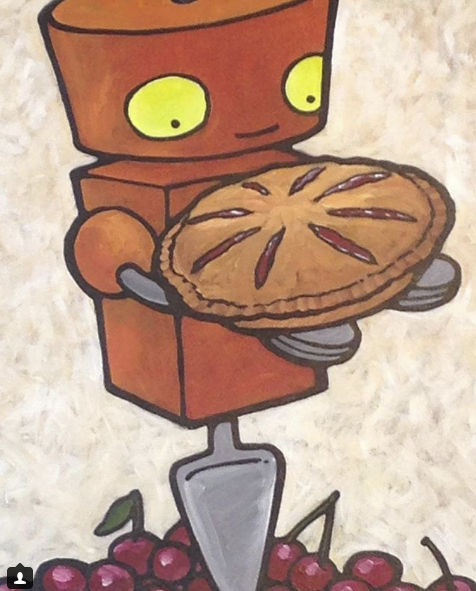 They're also the proud owners of the "Cherry Pie" Robot on display above the kitchen. This Nordeast anchor is the epicenter of Minneapolis local love. Huge selection of handmade goods, crafts, apparel, and artwork. You can find the Robot Adventure coloring book here. Underground lounge with music, cocktails, and home to the original painting Hill Country.